Herbert James Draper (1863–1920), Halcyone (1915), oil on canvas, 61 x 85 cm, Private collection. Wikimedia Commons. With the birth of Achilles, Ovid might have been content to proceed with the story of Troy. But before he takes us there in the next book (12), he tells a series of myths about Peleus, Thetis, and those around them. Oddly, these have hardly ever been painted, so this article moves fairly swiftly through most of them, showing the three works which I have been able to locate for them. Peleus, with his sheep and cattle, was forced to flee from Aegina to Trachis after he had been involved with his brother Telamon in the killing of their brother Phocus. When in Trachis, Peleus kept company with King Ceyx, the son of Lucifer (the Morning Star, not the devil). Ceyx told the story of his brother Daedalion, whose daughter Chione was raped on the same night by both Mercury and Apollo. She conceived by them, and gave birth to twins, Autolycus and Philammon. However, Chione was very beautiful, and boasted that she was fairer than the goddess Diana. uncertain wings, of such a sudden growth. and to his slender toes gave crooked claws. he is a cause of grief to all his kind. As Ceyx was telling that Daedalion was turned into a hawk, the royal herdsman rushed in and reported that a monster wolf was killing their cattle down by the beach. Ceyx had his men prepare to go and tackle the beast, but Peleus offered to deal with this by praying to the sea-goddess who was responsible. 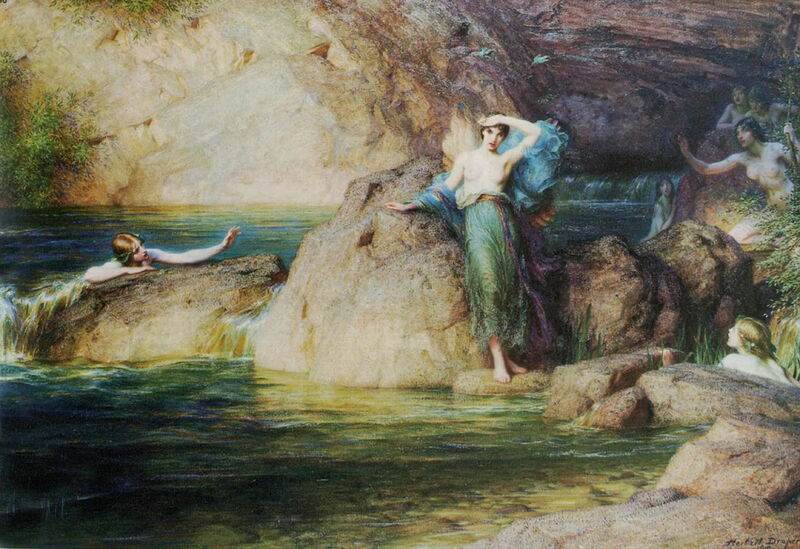 even when the sea nymph bade him turn aside. and should no longer be a cause of fear. in this land governed by the friendly king. of guilt by King Acastus of that land. Ovid’s penultimate story in Book 11 concerns King Ceyx and his wife Halcyone (or Alcyone), and is told at length, with several lyrical passages, particularly those describing the storm and shipwreck. Ceyx is still troubled by his brother’s transformation into a hawk, and wants to visit an oracle. However, the road to that at Delphi is blocked by bandits, so he is forced to go by sea to that at Claros in Ionia. That troubles his wife, but Ceyx points out that his father Aeolus rules the winds and should be able to ensure his safe passage. Ceyx sets out, Halcyone sobbing as he leaves. At first the ship’s crew have to row, because of the lack of wind, but soon there is enough wind to stow the oars and proceed under sail. By nightfall, the wind is blowing a gale, and the sails are fully reefed as they try to weather out the storm. The waves grow larger until they come crashing down on the ship. With water pouring into the ship, the tenth wave (by legend always the largest) breaks the vessel up, its sinks, and its terrified crew drown. Ceyx, his thoughts turning to his wife, clings to some wreckage, fighting for his life. Just before he too drowns, he prays that the waves carry his body to the shore, so that his wife can tend to it before burial. Muttering her name, he sinks into the black water and dies. sea water streamed down from his drenching hair. the sea and breaks the shoreward rush of waves. a mourning bird, and skimmed above the waves. she gave cold kisses with her hardened bill. the moving waves had raised his countenance. and they soon coupled and were parent birds. for his descendants’ sake gives halcyon seas. Ceyx and Halcyone are transformed into kingfishers. There seems to be no good reason that these stories have not formed the basis for fine narrative paintings, but apart from the occasional drawing – Poussin left one, for example – they appear not to have inspired the visual artist. Johann Wilhelm Baur (1600-1640), Chione (c 1639), engraving for Ovid’s Metamorphoses, further details not known. Wikimedia Commons. Johann Wilhelm Baur’s set of engravings to illustrate Ovid’s Metamorphoses include a particularly fine account of Chione (c 1639), with rich multiplex narrative. 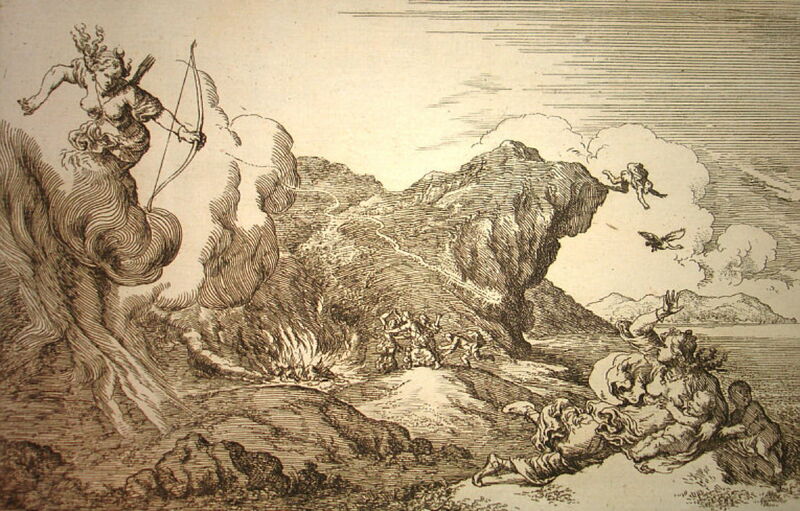 At the left, in the foreground, the vengeful Diana has just loosed an arrow, which is still in flight, at Chione, on the right. She is shown with her twins, Autolycus and Philammon. Behind them, in the centre, Daedalion tries to throw himself on Chione’s funeral pyre, and he then hurls himself from the sea cliff, being transformed into a somewhat ungainly hawk. Engravings of the story of Ceyx and Halcyone are not as impressive, but there is one painting and an illustration which were made at about the same time; after 1900 years, two artists both made paintings of this story! Herbert James Draper’s oil painting of Halcyone from 1915 shows the widow looking out to sea, watching Ceyx’s body float slowly in. He completes the story with a pair of kingfishers flying above her head, matching the kingfisher blue of her clothes. Helen Isobel Mansfield Ramsey Stratton (1867-1961), Ceyx and Halcyone (c 1915), illustration in ‘A Book of Myths’, by Jean Lang, 1915, Jack, London. Wikimedia Commons. Helen Stratton’s illustration of Ceyx and Halcyone, which was published in 1915, doesn’t follow Ovid’s account as closely. 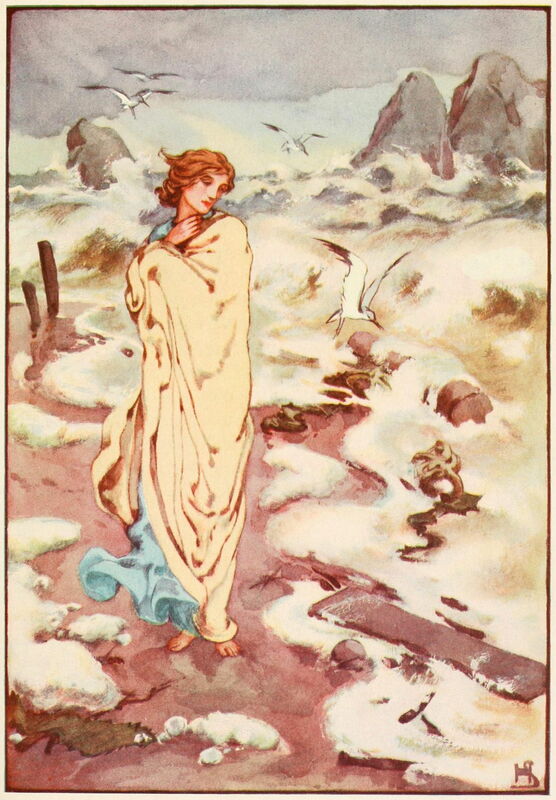 The sea is still rough, and spume covers the beach. Halcyone is walking past flotsam from the wreck, but the birds appear to be terns and are definitely not kingfishers (however inappropriate they might be on a beach). Given the length and beauty of Ovid’s story, it seems sad that it has been depicted so little. The next and final story in Book 11 has suffered similar neglect, and I will cover that in the next article in this series. Posted in General, Language, Life, Painting and tagged Baur, Draper, Metamorphoses, myth, narrative, Ovid, painting, Stratton. Bookmark the permalink.